The acronym 'OST' stands for 'Offline Storage Table' files of Microsoft Outlook. OST files allow users to work in the off-line mode during the absence of connection to the Exchange Server. It means. if you use Outlook as your mail client and MS Exchange as the server Server client and currently face a server down time, you can still work on your Outlook mailboxes with the corresponding OST files. Whenever, you go off-line due to any reason, Outlook creates off-line folders (with extension .ost), which are the exact copies of your mailboxes on the Exchange Server. These OST files are saved onto your local computer and the mailboxes appear as if you are connected to the Exchange. When you connect to the Exchange Server, these OST files get synchronized with the Server and all the changes made to these files get reflected in the mailboxes on the Exchange Server. Exchange profile has been modified or damaged etc. In such situations, the corresponding OST file can be helpful as a backup copy of your Outlook mailboxes. Here, you need to convert Outlook OST to PST file and work again with the Exchange Server. 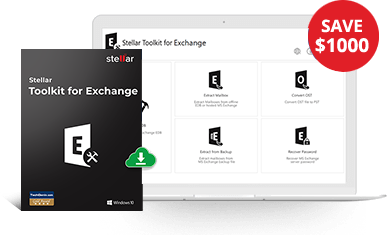 Stellar Converter for OST is a reliable OST recovery software, which efficiently converts the OST file into the corresponding PST file. The OST recovery software even recovers all Outlook mail components (Emails, Contacts, Notes, Calendar Entries, Journals etc.) from the corrupt/damaged OST files and restores them in a new PST file. In order to work with the mailboxes, the newly created PST file needs to be imported to Outlook. Open Microsoft Outlook. From the 'File' menu, select the option, 'Import and Export'. The Import and Export Wizard will open. Select the option, 'Import from another program or file'. Click 'Next' to continue. From the 'Import a File box', select Personal Folder File (PST) and click 'Next'. Click the 'Browse' button to locate the PST files, which need to be imported. Select appropriate options and click 'Next'. In the 'Import Personal Folders' dialog box, choose the folders; you need to import in Microsoft Outlook and click 'Finish'. Stellar Outlook OST recovery is completely read-only in its operations and preserves all HTML, RTF formatting of the emails during conversion. Moreover, with simple and highly interactive graphical user interfaces, the software is very easy to operate, without even any further assistance.